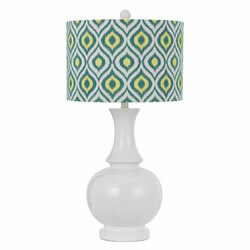 An exotic design with a modern twist, our Casbah table lamp features a drum shade covered in a colorful, yet sophisticated, IKAT patterned fabric in poly linen. The white high gloss resin base creates a dramatic look with just the perfect touch of glam. No two are alike.